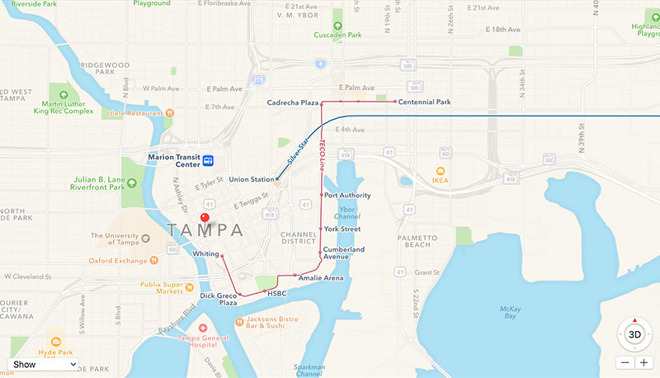 Apple Maps adds public transit directions for Tampa, Fla.
Apple has activated public transit directions in Apple Maps for users in Tampa, Fla, granting access to timetables and routes covering local bus, train, and streetcar operations. The new addition, recently noted on Apple's iOS Feature Availability website, enables public transport data sharing with a number of services including the Hillsborough Area Regional Transit and Pinellas Suncoast Transit Authority (PSTA), as well as Amtrak and the TECO Line streetcar. With the new information, Tampa residents and visitors are able to plan trips and create routes using Apple Maps. As with other Transit deployments, arrival and departure information gleaned from first-party sources is integrated into the app for easy city navigation. Apple Maps is also showing real time travel advisories like planned detours and construction delays, complete with expected completion dates. In addition to timetables, Apple Maps Transit directions incorporates 3D renditions of larger bus and train stations, including entrances and exits for fast, efficient on-foot travel. Apple reinserted Transit data into iOS with the release of iOS 9. Instead of using Google's mapping technology, the tech giant's public transportation data platform is powered by IP acquired through purchases like HopStop and Embark. The rebuilt Transit feature provides routes, departure times and other relevant data for buses, trains, ferries and other forms of public transportation. In addition to local schedules, users can access top-down views of select underground subway and train stations. Apple is working to build out coverage after launching Transit with minimal support in the U.S. and China. Beyond major metropolitan areas in the U.S., Apple is concentrating Transit efforts across the UK, China and Japan. Earlier this year, Apple delivered the service to in Paris, Singapore, the Netherlands and Adelaide, Australia. Most recently, Apple added public transportation data for users in Phoenix, Ariz., in October.